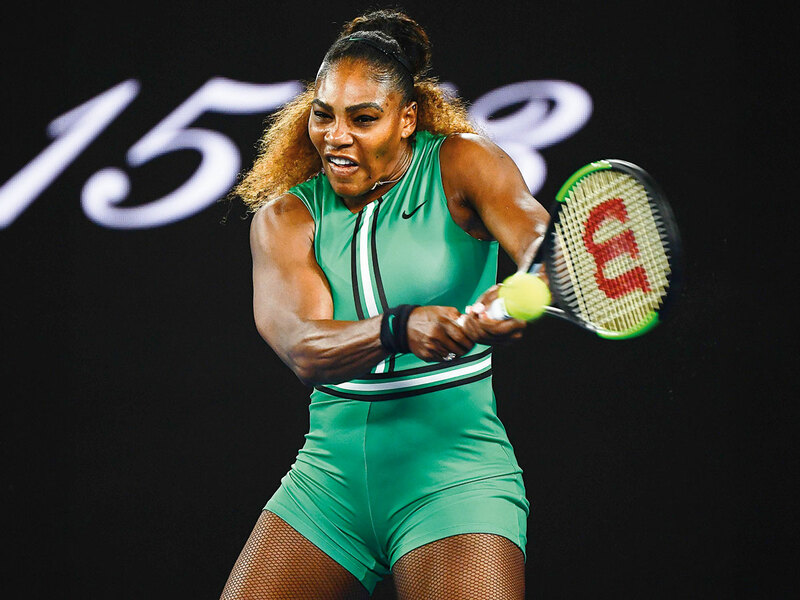 Melbourne: Serena Williams stepped up her drive for a record-equalling 24th Grand Slam on Thursday by swatting aside Eugenie Bouchard, but top seed Simona Halep had to dig deep to stay in the Australian Open on a day of epic battles. Men’s world No. 1 Novak Djokovic won an emotional 2008 Australian Open final rematch with Jo-Wilfried Tsonga. The Serbian top seed is also looking to make history by winning a seventh title. In contrast to Williams, world No. 1 Halep staggered through against American Sofia Kenin 6-3, 6-7, 6-4 — her second three-set test in a row. “I have no idea how I won this tonight, it’s so tough to explain what happened on court,” said the French Open champion, who now meets Venus Williams after the 38-year-old rolled back the years to beat France’s Alize Cornet. In another titanic battle, Canadian Milos Raonic ousted 2014 champion Stan Wawrinka in four tightly contested sets that all went to tiebreaks, while eighth seed Kei Nishikori was stretched to a draining five sets against Ivo Karlovic. Seventh seed Dominic Thiem limped out when he retired while losing 7-5, 6-4, 2-0 to young Australian wild card Alexei Popyrin. Thiem went through a first round five-setter against Benoit Paire that finished in the early hours of Wednesday morning and he never looked 100 per cent. US Open champion and fourth seed Naomi Osaka had it much easier, sweeping past Slovenia’s Tamara Zidansek 6-2, 6-4 with the roof closed on Margaret Court Arena after rain interrupted the opening major of the year. The 21-year-old’s breakthrough at Flushing Meadow over Serena Williams last year made her a new standard bearer for tennis in her homeland, Asia and the next generation of women, and she is working hard on living up to the hype. “I thought I served all right, this was my first time playing her and I’m just happy to win to be honest,” Osaka said after setting up a clash with Taiwan’s Hsieh Su-Wei. In contrast, Asia’s top-ranked men’s player Nishikori needed an energy-sapping 3hr 48 min to get past big-serving Croat Karlovic 6-3, 7-6, 5-7, 5-7, 7-6 in humid conditions. Alexander Zverev almost blew his quest for a maiden Grand Slam title before registering a 7-6, 6-4, 5-7, 6-7, 6-1 win over France’s Jeremy Chard. The fourth seed looked far from his anointed status as the flag-bearer for the next generation as he struggled to put away the veteran world No. 36, who is 10 years his senior. The Swiss, unseeded for the first time since his debut in 2006, fell to the Canadian 6-7, 7-6, 7-6, 7-6. Raonic, who got to the Australian Open semi-finals in 2016 before losing to Andy Murray, will next face France’s Pierre-Hugues Herbert who beat last year’s semi-finalist Hyung Cheon of South Korea. Other women through included Italy’s Camila Giorgi and China’s impressive 21st seed Wang Qiang. Belgium’s 12th seed Elise Mertens lined up a third-round showdown with American Madison Keys. Men staying in the hunt included 11th seed Borna Coric of Croatia and Spain’s 23rd seed Pablo Carreno-Busta.